We offer these single-centre holidays year-round…you choose dates which work best for you, and we’ll get it booked in. Combine guided rides with accommodation in Beaulieu-sur-mer between Nice and Monaco, or in Nice. With so much variety on the doorstep, there is no need to move from one place to the next each day; here you can ride every day for a month on different roads! We organise everything for you: airport transfers, cyclist-friendly B&B accommodation in Beaulieu-sur-mer or Nice, “in the know” itineraries combining classic climbs with little-known gems, an experienced guide to lead you along the quietest and most beautiful roads, pointing out the places offering the best coffee and pastries and where to top up your water, all wrapped up with seamless logistics so you can relax and focus on getting the most out of your trip. Settle in, relax, and enjoy the cycling! 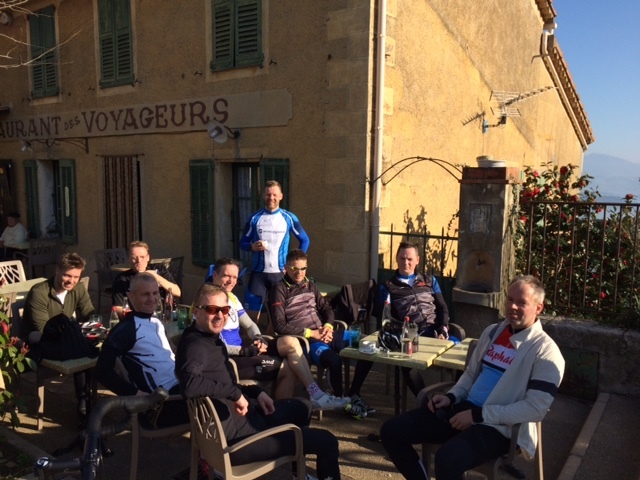 You can come as a lone cyclist joining a mixed group, or, with just 4 or more people in your group we can create a completely exclusive, private and bespoke experience with an itinerary specific to the objectives and ability of your group. Take an early flight from any airport in Europe and you can be in Nice before Midday. With a short 30-minute transfer, we can get a full afternoon ride in on the first day. Take an evening flight from Nice on your departure day and you can enjoy a full day’s ride. You choose which days and what time to arrive and depart, so you can ensure your trip fits in with work or family plans, or take advantage of the cheapest flights. Bike hire: Do you need to hire any bikes? If, what size (or your height), and what pedal type? Level: At what level does your group ride? What kind of rides are you looking for e.g. time in the saddle each day, how much climbing? At the heart of all our trips is the “Tour d’Azur”. This is not a fixed itinerary, but a number of days riding from Beaulieu or Nice crafted bespoke for each individual group of 4+ people based on the number of days in your trip, and the distance and climbing your group wishes to do. Whether you are here for a long weekend, or a week or more, we will shape your Tour d’Azur to capture the key cols and descents, and build in any events in which you are participating. All prices are per person, based on 2 people sharing. Single supplements apply. Experience a tour of the spectacular Gorges du Verdon, known as France’s Grand Canyon, on the first day, and contrast that by tackling the “giant of Provence” on the next. Take on the highest paved road in Europe, climbing 1,650m to an altitude of 2,800m, as part of a 2-day excursion into the Mercantour national park, including a selection of the most challenging climbs of the southern Alps: Col de Cayolle, Col de la Lombarde, Col d’Allos, Col de la Couillole etc. A 2-day exploration of the Ligurian mountains north of San Remo, including the Poggio climb in San Remo itself, famous as the final climb in the Milan-San Remo classic, as well as Passo Ghimbegna, Passo Gouta and Passo di Teglia amongst others. 25% of the trip cost is payable as a non-refundable deposit on booking. The balance of the trip cost is due 3 months before the arrival date. If the balance is not paid by this time, the booking will be cancelled and the deposit forfeit.